Am I the only one who kind of ignores their guest bedroom when you’re not actually expecting guests? 99% of the time, our guest room is actually our cats’ hangout, plus where we keep our folded laundry when we’re too lazy to put it in the closet. Our guest bedroom also became the room for hand-me-downs from apartment’s past. Our old mattress, our old wall art, and other forgotten pieces that were still functional after we upgraded to “adult” furniture for our master bedroom. It’s also the smallest room in the house, so there’s not much we can add to it beside the bed and a few side tables without it being cramped. With the holidays just around the corner, though, I’ve decided to make it a little more welcoming and functional. Keep reading to see how I prep our small guest bedroom for the holidays and many guests to come after that! When we bought our house, one of our priorities was getting a bigger bed. After we upgraded to a King, we put our old Queen spring mattress in the guest bedroom. After years of use, the springs were definitely squeaky and the pillow top had pretty much flattened out. Now, I’ve definitely slept on guest beds that make me miss mine badly. I didn’t want my guests to feel the same way! With a small guest bedroom, we can’t fit a lot of furniture or decor inside to impress, but a comfortable bed can make a lasting impression. Shopping for a mattress can be a hassle… and actually moving it in/getting rid of your old one is a pain! So when Saatva reached out to me and offered to upgrade my guest bedroom mattress, I was stoked. This is another great exclusively online mattress company, but with unparalleled service. Not only are the premium, eco-friendly luxury mattresses affordable, but your purchase comes with free delivery AND free mattress removal. Plus, you get a 120-day home trial to really break in the bed and decide whether or not you love it (but, you prob will!). 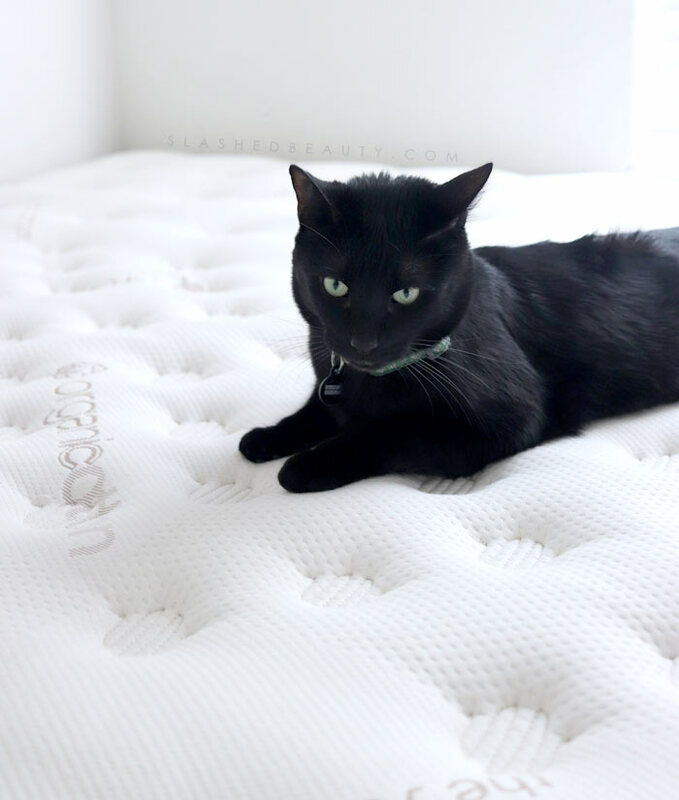 The mattresses are made with an exclusive botanical antimicrobial fabric treatment that stops bacterial growth to help prolong the life of the cotton, which I love since this bed will be shared by humans and pets alike. Their mattress are completely customizable, as well. You can choose your comfort level, size, and mattress height. We went with the Luxury Firm level as it’s labeled as a favorite among over 80% of their customers, and figured it’d be the “just right” bed for everyone. 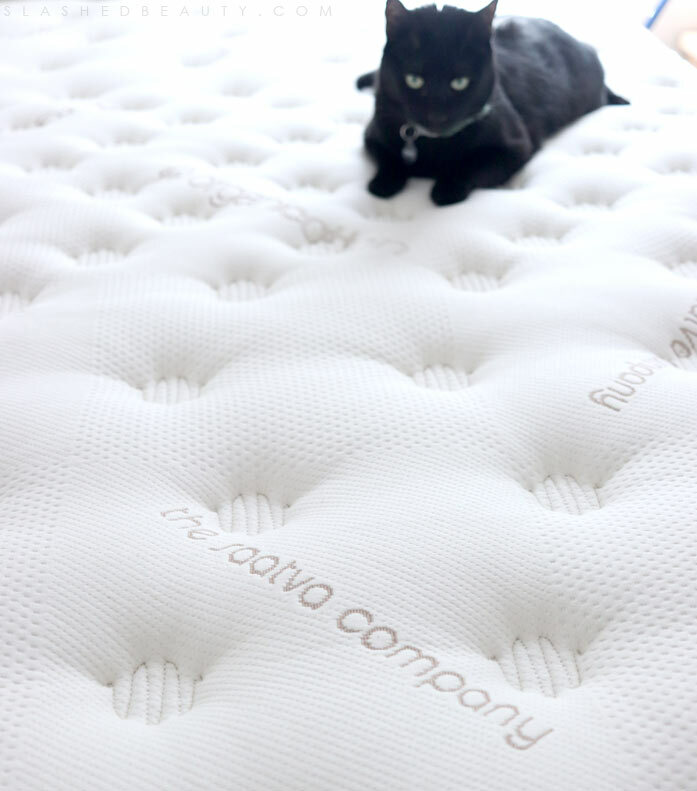 The Saatva mattress is supportive but plush, making it comfortable for most sleeping positions. It was probably the easiest mattress upgrade experience due to their awesome customer service, and made prepping my guest room less stressful. I highly recommend these affordable bed-in-a-bags from Amazon, pictured above! 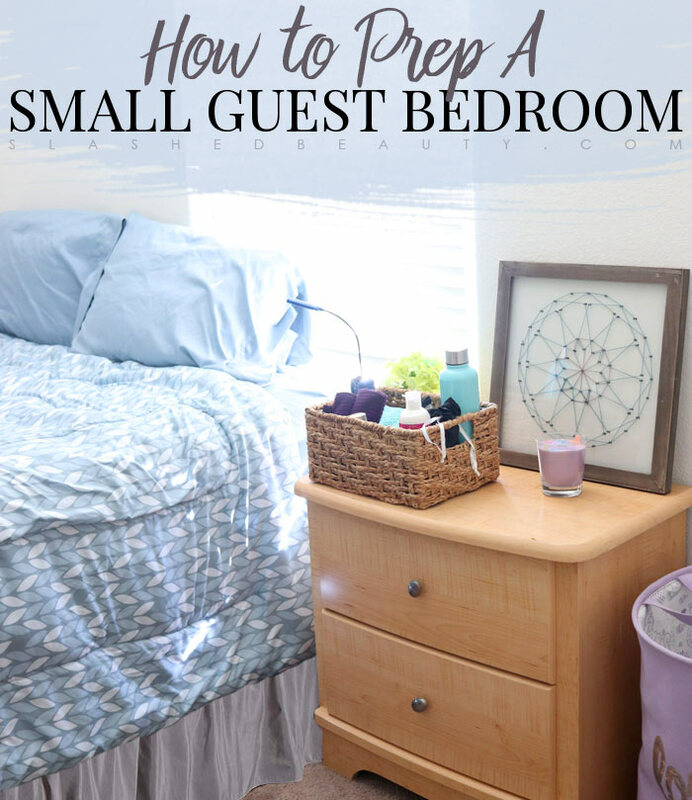 I am so guilty of using my guest bedroom as a catch-all, just throwing stuff in and shutting the door to help clean up OTHER rooms of the house. So in an effort to make it more guest-ready, I’ve cleared away clutter. Keeping your guest bedroom clutter-free will create a more relaxed environment… nobody wants to tip toe around piles of someone else’s stuff! It also helps a small guest bedroom look more spacious when it’s simple and clean, and gives your guest room to spread out. If you need to stow stuff out of sight, utilize the area underneath your bed and hide it away with a bedskirt. I’ve also created more storage for my guests by going through the drawers, which used to be filled with random knick knacks and forgotten times, and cleared space for folded clothes if they’re staying long enough to unpack. This creates a sense of home-base so guests don’t have to rummage through a suitcase the whole trip. Reusable Water Bottle: Vegas is a dry climate, and my out-of-town guests are always amazed at the effect this has on their thirst. Making a reusable water bottle available allows them to help themselves to water from our fridge and keep it cold by their bedside throughout the night. Lint Roller: If you have a pet-friendly home, this is a MUST to offer guests. You may be used to the pet hair, but your guests may not be. This retractable roller protects the adhesive so that the sheets last longer! Book Light: I personally love reading at night, and book lights let me illuminate my page but keep the rest of the room dark so I can wind down. 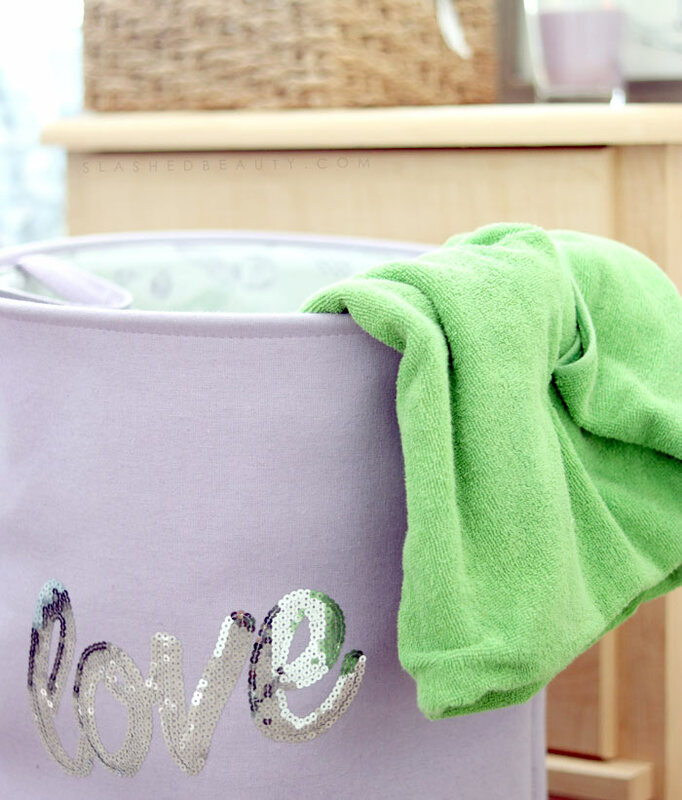 Washcloths: An abundance of washcloths is always appreciated to use for both showering and for a skin care routine. Sleep Mask: Everyone has their own preference of how dark they like a room to be when they sleep. If they can’t quite achieve that in your guest bedroom, a sleep mask could be the difference between good and great sleep. Q-Tips: A small item that is often forgotten, I know I hate when I travel without cotton swabs for after the shower! Skin Care: I include samples of face wash and moisturizer that I’ve received as free gifts with purchase, just in case they need something extra. Lotion: Since TSA has cracked down on liquids in carry-on bags, I often travel just hoping that my destination has decent lotion! 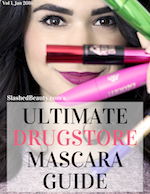 It’s one of those things you might not think about until you really need it. Advil: Traveling can be stressful, especially during the holidays. Give your guests easy relief by keeping a headache remedy nearby. It’s probably safe to say that most people are used to having their phones nearby when sleeping— many use them for alarm clocks, even! Make sure outlets for charging are accessible in your guest bedroom. In small guest bedrooms, you may be forced to block outlets with furniture. If this is the case, be sure to run an extension cord and offer a power strip for multiple devices to be plugged in at night. These small preparations can make a big difference in making a small guest bedroom comfortable and inviting. I’ll admit that our’s isn’t decked out, but now I feel like it’s an actual guest room versus a storage room. What do you do to make a small guest bedroom comfortable? I enjoy reading your blog. 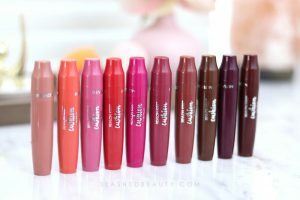 By reading your blog I find out about products of which otherwise I would not have known. Keep up the good work. By the way, just in case you share my email address with any companies could you not please. I don’t share emails, don’t worry! Thanks Maribel! So glad that you enjoy reading. I put a special extension cord with USB and regular outlets on it. I loved it so much, I bought one for my bedroom, too!